It replace "GOG Win 95 experimental patch" and can be installed to GOG or Steam. You can customize options installing this pack over previous installation. More details is included in rtf/txt file - read it before install! Big thanks to Toshiba-3 who helped me very much with this project. Discussion which started this project. This project using method which I described there. Please leave you feedback: problems, questions or thanks. Thank you! Note: It's unofficial, so not supported by GOG and Steam (Valve). After few days of work, New version of 95 RPP is ready! Now with HD Test by Hifi & Toshiba-3 :) build in! I have changed execs / folders names, but it's "the same" as available on Road Reaction. BTW: It need "proper" PROG.ACT to work, or encrypted files (as I do), since included exec can't en-/de-crypt HD sub-folders. Also when the files are located like on CD, HD exec can't find them - the HD Test folders must be copied manually to game folder (game installer - which is, of course not part of HD Test - doesn't copy the HD files either). The Color Fix is set to work with this HD Test version, also boring mode and "password protection" (as option) are available. I have set up completely new HUD coordinates, based on original files - it took me few hours (only) to calculate - using OpenOffice Calc and copy-paste to OO and copy-paste from OO, then replace tabs with "," :) Result is that all cars have proper external view, when internal view remind untouched. BTW: The fields under text are set to same size as in internal view, since when set bigger - strange things happened - like sizing wrong or disappearing randomly - it need further investigation. Unofficial Carmageddon Patch is also updated to match changes in 95 RPP. Very nice work, once again. Tested this last version on a fresh install and it works very nicely. After all, including the HD execs is probably good, esp. as it isn't on by default. It's gonna please a lot of people! Also posted about it on GOG forums. That's a brillant idea, too bad we can't set the camera even higher and flip the sprites to be seen properly from top-down view. Bug fix release this time. Now it should work no matter if 95RPP HD Test or UCP is installed first. Some other tiny bug fixes. Thank you Toshiba for posting on GOG. I'm not using the "patch" name for it, however now it's actually also a small patch... it also use patch method for restored / new files to keep small size of archive (it can be even smaller). Today I was trying to "resize" a internal view, it can be done, but except for cockpit pixelmap, which resized crash the game... it can be cleared to whole transparent and it working... when there is something painted it crash... As far as I remember you have described this somewhere already :) Also HD cockpit pixelmap is much bigger in size. - Custom keyboard controls are changed to new reedited files from CKB - help added to readme. - colorfix is updated to match other projects - disable or enable colorfix work for them all (global). Note: If you are using modded version with colorfix you need to update it and reapply colorfix. I can't get more than 20fps with HD TEST mode 1080. Nglide+DOS or W95+ddraw strecth@1080 works 50fps. I never really paid attention but it's the same for me. I guess it's too much for software mode while it isn't made for HD nor taking advantage of multiple cores. 3DFX + Glide is hardware accelerated so it's often the fastest experience (kinda wish we could disable texture filtering). And Carma95 stretched to HD is still the vanilla 640x480 so it's easier on the CPU. Nothing to do about this to my knowledge! Toshiba-3 wrote: I never really paid attention but it's the same for me. I guess it's too much for software mode while it isn't made for HD nor taking advantage of multiple cores. With NGlide wrapper+Dosbox, I can set internal resolution to 1080, same as HDTest 1080. But DDraw.ini stretches 640x480 to 1080 - is it possible not to stretch, but instead run Carma95 with DDraw in native 1080, just like HDTest or NGlide does? 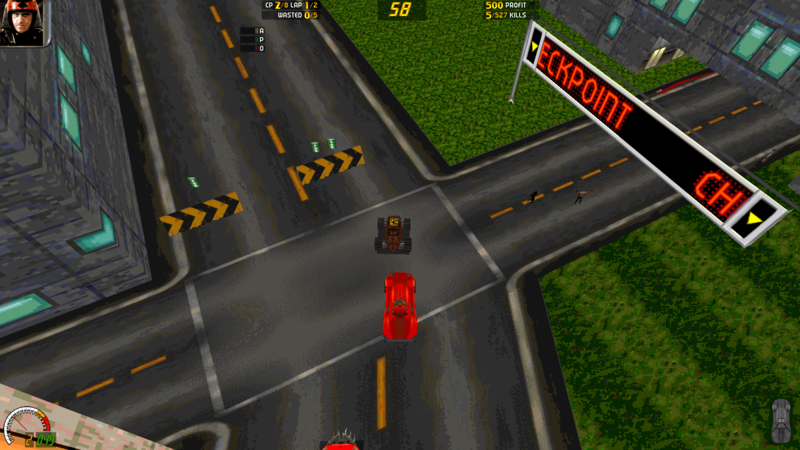 PS: Anyone got dgVoodoo+DosBox+Carma running? Sadly hifi's ddraw can't alter the internal resolution by itself. This is why Carma95 was slightly modified into the HD test (it is indeed nothing more that Carma95 with its internal res set to either 1280*720 or 1920*1080). The "HD test" executables use ddraw as well. Have you tried changing the renderer to gdi (or to opengl if it was set on gdi) in ddraw.ini? dgVoodoo 2 works with C1 + DosBox here, just less performant than nGlide here. I can't seem to make the game work properly once I installed this. If I set it to use CD music, the game won't start (but the process will still be in the background and using a lot of CPU) and if I set it to not use CD music, there's no music at all. What version of Windows are you using? This sounds like the usual winmm.dll problem. Isn't there an option for the old cdplayback wrapper in the 95RPP exec? If not you can try either the old one contained in this archive: http://rr2000.toshiba-3.com/R4/PC/carma-winmm.zip (under 'old' folder) or then the more recent one (with the other dlls too) which is at the root of that same archive. Just place them along the executables in the C1 folder. Overwrite the files if asked. I am using Windows 10. When I said I was setting (or not) to use CD music, I meant to say I tried setting the option for the wrapper on or off during the installation of 95RPP. When it was off (as is by default) the game worked, but without music. When it was on, the game would not start at all, though the process was in the background and using a lot of CPU. I'll try the old and new dlls soon and keep you updated. Update/Edit: With the old wrapper, game wouldn't start. With the new wrapper, game started, but still with no music. I forgot to ask: which version are you playing? Steam/GOG/MeldPack/own CD? I suppose Steam? Can you make sure there is a MUSIC folder with ogg files within the CARMA directory? Oh, I probably should've mentioned that, my bad. I'm using the GOG version, which has the MUSIC folder and the ogg files. I've also tried opening the files to make sure they played properly, which they do. I installed the GOG release, 95RPP upon it, then the updated winmm.dll but sadly can't reproduce the problem (I'm running Windows 10 as well). I suppose you tried already, but if you didn't I'd suggest trying to reinstall the whole thing? If you're launching the game via GOG Galaxy, then running it from the exectuable directly. Checking if your system's CD playback volume isn't muted (unlikely). Because if winmm.dll is present (along with libogg-0.dll, libvorbis-0.dll and libvorbisfile-3.dll), MUSIC folder is present, and you run Carma95, then theorically there's no way around it playing the ogg files. Maybe QTZ would have other ideas. I was opening the game from GOG Galaxy all along because I couldn't find the launcher in the game's folder (and I still can't, I just opened one of the game exes directly) and this was the problem, the music works now, thanks a lot! EDIT 2: It works now. I'm thinking I might've either used the launcher without the shortcut without realizing, or I got the blank track 9 and thought the music was broken again. Anyway, everything should be fine now! I figured out what made me think music was still broken: When I set the launcher to skip intro cutscenes, music actually does not work. Is there a safe way to always get the music working? Like running CARM95.EXE directly? That could indicate the launcher is at fault somehow. Yes, the music was working properly when I was running the exes directly. I remember seeing something about destination or location being too long being a problem, so I'm thinking maybe it's not directly the launcher. Maybe the fact the launcher is in the DOSBOX folder while the executables are in the CARMA folder and the fact the HD test executables have a very slightly longer name contribute to this, and on top of that maybe settings like nointro and windowed are added at the end of the destination like -windowed or -nointro like you can do on a shortcut with certain games, which causes the destination to be even longer. I need to investigate this... someday... however HD Test included in 95RPP have only one character longer filenames... so folder name do bigger difference... Launcher (dosbox.exe in this case) running Win95 version from short path (C:\MAX_PACK.W95\...), when DOSBox version is running from launcher path (Steam/GOG installation path). In DOSBox we have short path anyway.